I feel like phoning my younger son’s super-cool Science teacher, and inviting her over to the kitchen for this week’s exploration. I really want to put on my lab coat (I was given one, by a doctor friend, for auditions. I have, I think quite convincingly, played many a nurse/lab technician on TV), and my elder son’s chemistry glasses. Okay, maybe that is taking it a little too far. I am delving into the research section of the Ecole Chocolat curriculum, and am conducting Philippe Conticini’s Flavor Experiment. Monsieur Conticini is a fascinating person, and his gorgeous creations are well worth a look-see. Since I am no Mozart of the Pastry as is Philippe Conticini, I am paring it back to the basics, and conducting his flavour test, adapted slightly by Pam Williams of Ecole Chocolat (the adaptation cuts out the unwanted taste of a piece of angel food cake, leaving the pure taste of ganache). Take a favourite flavour that you want to incorporate into a ganache: an herb, spice, fruit, or liquor, etc. Prepare a batch of ganache. 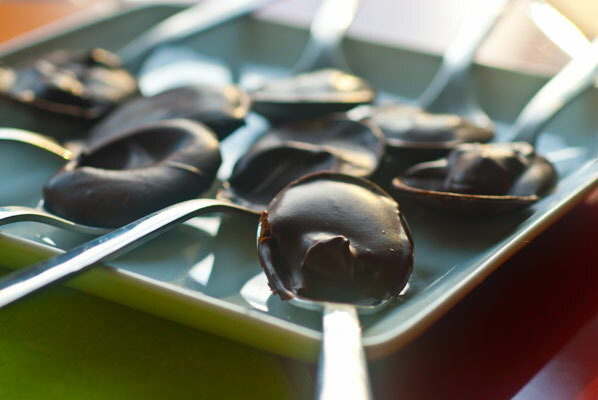 The idea is that this experiment allows you to play with flavours without having to dedicate a whole recipe of ganache, and perhaps spoiling it, by adding too much of a good thing. This way, you can find the ideal amount of flavouring, for a particular ganache recipe, expanded and extrapolated from your calculations – there – that sounded exactly like some dialogue I had to say on TV, once. You are trying to find the balance of chocolate taste, with whatever you are flavouring it, without overwhelming the chocolate. You want to be able to taste both. So, it is important to start with very good chocolate, very fresh cream (for the ganache), and very fresh flavouring ingredients. Step one: I collect my motley group of spoons and wash them, rinsing thoroughly in hot water to remove even the tiniest amount of dish soap. The last thing I want is for all of my precise and delicate flavour measurements to be thrown off by a soapy spoon – ugh. I now prepare a batch of ganache. I love doing this, transforming the mixture from a greasy, ugly mess to a satiny smooth mass. I use a very straightforward recipe, with a 1/1 ratio of chocolate to cream. Once the hot cream has been added to the partially melted chocolate, in 5-6 additions, avec beaucoup de friction (as Chef Fred Bau says), and I have my smooth ganache ready, I scoop a dollop of ganache into each of my spoons. I use exactly 5 grams of ganache per spoon, and since I have weighed the spoons before beginning this experiment, it is a simple matter to add the ganache amount on to my recorded spoon weight. Most electronic kitchen scales can, of course, be zeroed, so you can just plunk the spoon down on the scale, re-set it, and then put on the ganache. I do like to know the weight of each spoon however, in case anything messes up. And now, the flavouring. I decided, in homage to my favourite truffle: Thomas Haas’ Jamaican Rum, to use Appleton Estate 12 year old Jamaican rum, for the test. An interesting choice, in hindsight, as I don’t actually drink rum. I just really like the way it tastes in things. 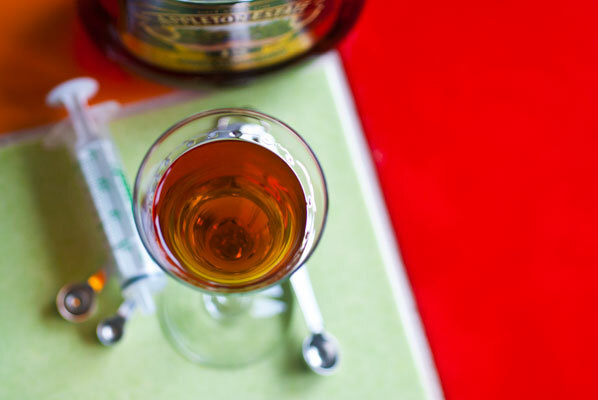 I fetch a still-in-the-sanitary-package medicine dropper (I think it actually came with some veterinary supplies, but our cat’s infection had cleared up by then), a liqueur glass, and I pour out a measure of the amber liquid. -overwhelming, acrid alcohol taste, bitter, too much rum! So, with this particular ganache recipe, I found 12-15 drops of rum to be ideal. I measured this amount of water into one of my sets of measuring spoons, and found it to be 1/8 tsp. Extrapolating these numbers, I conclude that 1/8 teaspoon rum to 5 grams of ganache seems to be ideal. 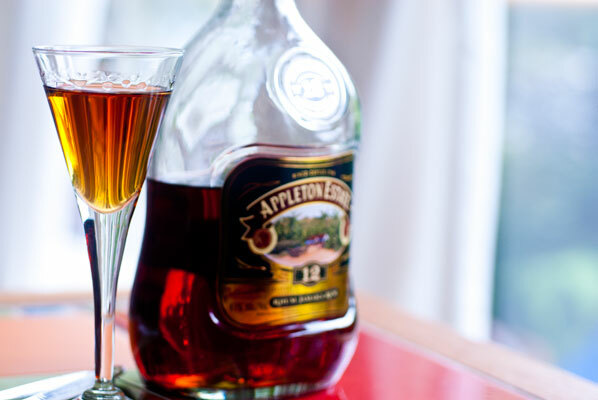 So, if I am making a recipe of 1000 grams (1 kilogram or 2.2 pounds), which is a realistic commercial weight, I would need 25 teaspoons=2/3 cup=150ml of Appleton Jamaican rum. I am, by now, heartily sick of the taste of rum, and a bit worried that I have been affected by the bitterness of the alcohol. Everything tastes the same and I am feeling a little overwhelmed, so I down a large glass of water, brush my teeth and take myself off to bed. The next day, I try fifteen drops again, with another carefully measured 5 grams of room temperature ganache (I had quite a bit leftover) to test my theory. I find it tastes nicely balanced. 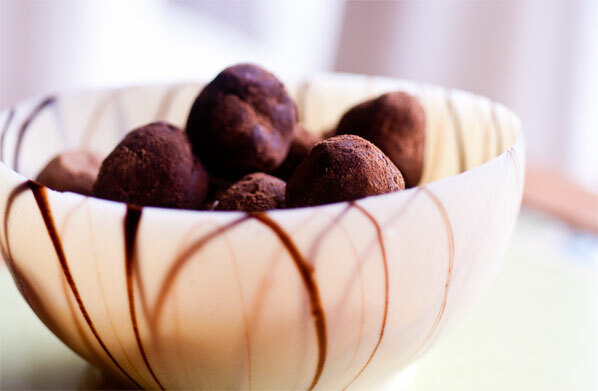 The rum seems to warm and sweeten the chocolate, just a touch. I could perhaps, cut back to 12 drops, but I think I’ve found my “sweet spot” (literally) for this recipe, especially if I were to coat the ganache with a layer of couverture. And now I start thinking about other flavours. Perhaps I could add in a touch of banana, with the rum? What about crystallized ginger? Or coffee? I think this means my taste buds have recovered, and it’s time to head back into the lab to run this test with all these other flavours. 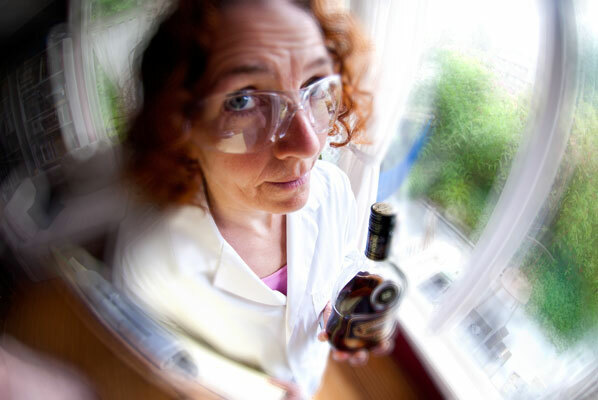 I am feeling much more confident now – I feel I have earned my lab coat. As science experiments go, this one is pretty sweet.